Top: J. Crew | Bottoms: Zara (looove these, perfect for all year-especially the Holidays!) | Flats: Tory Burch | Watch: Michael Kors | Bracelets: J. Crew + Stella & Dot c/o | Earrings: Nadri | Necklace: Baublebar | Lips: Laura Mercier in Plum. Gorgeous look lovely !! Love your puppy ! So sweet ! Oh my goodness! Your dog is so sweet!!! What kind is she? And you look very pretty! What a wonderful fall photoshoot. 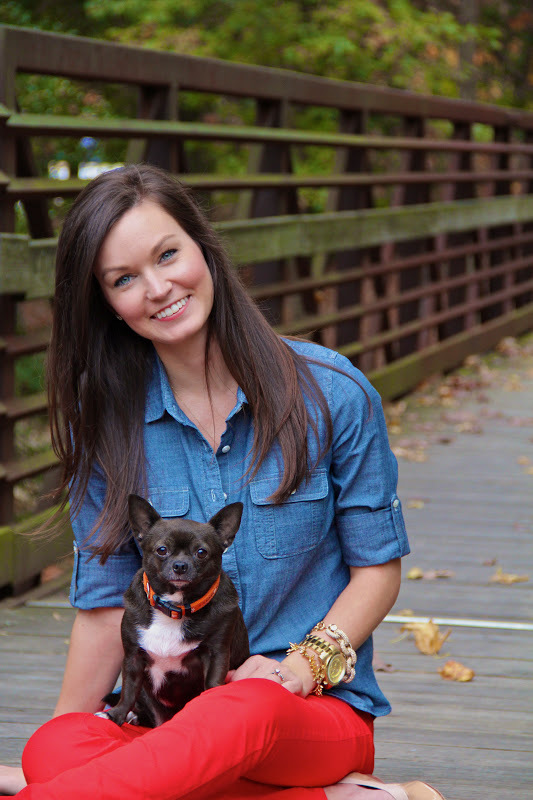 Aww, your dog is adorable - love this simple casual look...those bright skinnies are so fun! Hahaha man your dog just made my day. Soooo cute. I love red pants with chambray! And your little dog is sooo cute! Great photos! Love the red pants! I love this whole outfit! I need some tb flats! Cute puppy! I love your flats, I have the same ones. Love how casual your outfit is! Megan, you are too adorable! You can't ever go wrong with chambray can you?! Love the red pants - very cute! Awww... the pup is adorbs! Love those red skinnies - too cute! what a cutie! love those red jeans also! LOVE this look. I've been on the hunt for a good denim shirt for quite some time now. I JUST LOVE THEM! I love the simple look of this outfit and the red adds a nice pop of color! Adorable photos! I am loving the whole outfit, isn't chambray the best ever??? You are so gorgeous!! Love your style so much. This outfit is so casual yet so chic :-) Tory Burch flats are my favorite! You nailed this post. Love this outfit and your cute dog! Great flats by the way! I love chambray shirts. They go with everything! So cute! Love the red and blue denim together! Super cute! love the outfit too! I like the chambray and red. Your little pup is a cutie too! Your pup is beyond adorable - she's so well-behaved! And I adore the denim/red combo - you've got some great legs! What a cutie! Oh, and it is okay to be a bit biased. Love those flats. I've been considering them for the longest time! Love this simple casual look on you!! Cute puppy:) My kids would love him! How cute are these pics?!!! She is adorable!! 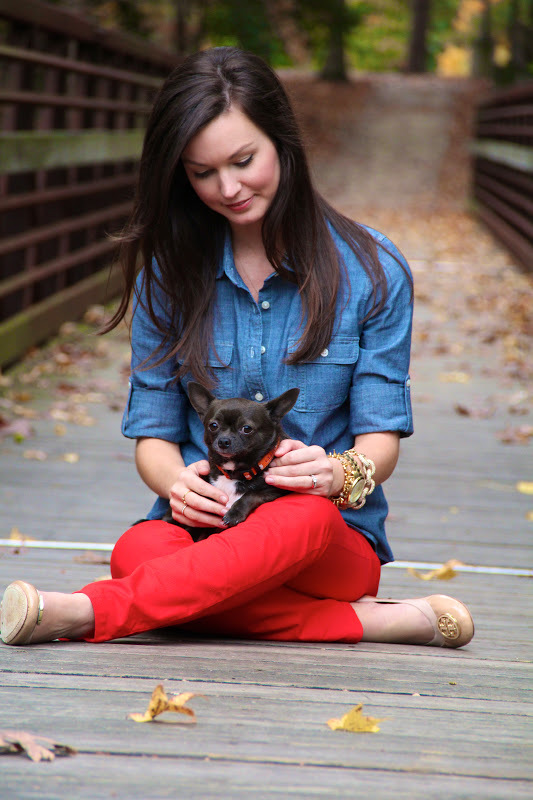 Love the chambray shirt, red jeans, and tory flats! Great look darlin:)! Very cute and I love your outfit! 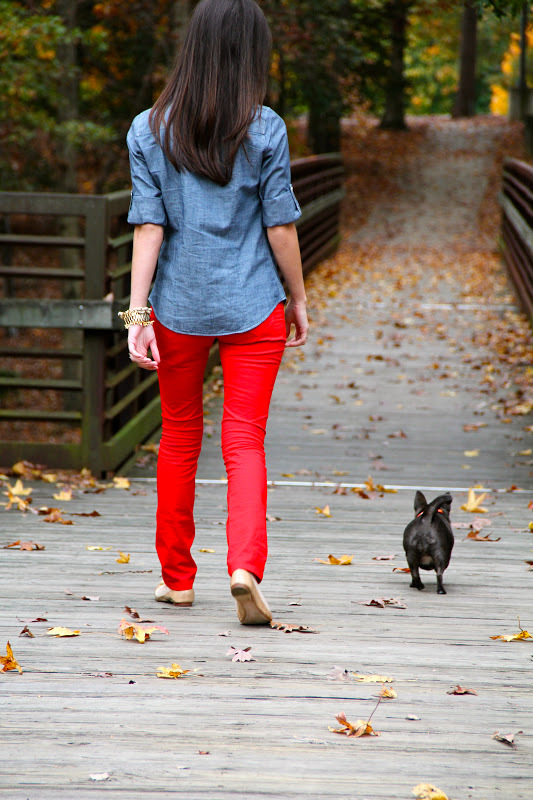 I love the denim & red combo and your doggie is so cute! GFC and Facebook, can't find your Bloglovin'? Your blog is amazing! I love the all american look. Love it! Your dog is precious. nope your not bias... she is adorable!!! You look great as well! Love the red pants and chambray shirt! Plus your dog is so cute! !